I thought with Election Day upon us, and the fate of the White House for the next 4 years here, now would be a good time to talk about something extremely important:ignoring the noise. Pretty much everything out there that's trying to distract you from reaching your long-term goals. It's almost everything that's short-term in nature, that will really have minimal net effects on your success over the long haul. The election is noise, the euro issues are noise, media is certainly noise. Does it really matter who gets elected? Doesn't the President have a lot to do with national policy like taxes and regulations which can certainly impact the companies we dividend growth investors own a percentage of? Yes, they do. But, what you must keep in mind is that Presidents come and go...every 4-8 years like clockwork since that is national policy. Taxes and regulations in turn, too, come and go. Over the last 100 years taxes have gone up and down, regulations have been imposed and removed. Oil crises have been here, we've been through major wars and technology and medicine have drastically changed. There have been many, many elections like the one we have upon us where the nation was captivated by the nature of it, wishing for change and clamoring about how businesses and the stock market would be affected. Hmm, that's quite a run! 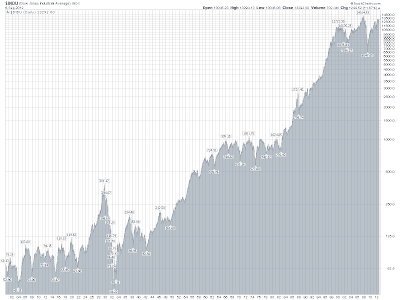 You can see some major dips in there, most notably thecrash of 1929. 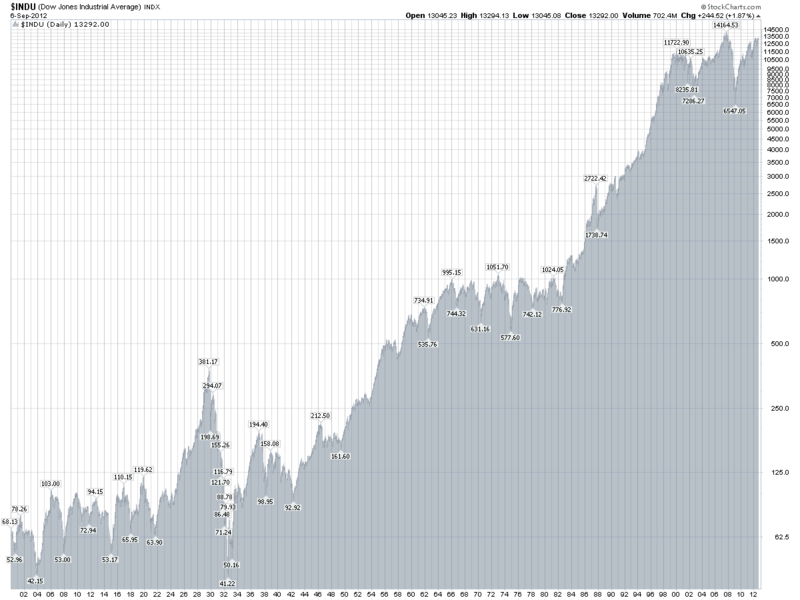 But, what really stands out is the epic march upward. What does that chart tell me? It tells me what an investor needs to do is ignore the noise. Whether Obama is re-elected or Romney wins the White House won't really matter when you're investing in high quality companies for the next 50 years or so. Will I suddenly stop investing in world leading companies that raise their dividends annually over the rate of inflation and sell products or services that society deems worthwhile enough to pay premiums for because someone I wasn't rooting for wins the Presidency? Hell no. So if the election is just noise, and doesn't really matter...what does matter? What matters is company fundamentals like cash flow, earnings growth and debt loads. I think management matters. Wide economic moat qualities like economies of scale, brand name products, global reach and the ability to raise prices over time to meet or exceed inflation matter. Innovation and the ability to change matters as well. These things matter because they will affect how well a company does over time. What also matters is valuation. Valuation matters because it will affect how well you perform as an investor over time. Buy even a high quality company at too high of a price and your total returns will suffer, and you will also receive less yield on your money than you otherwise should have had you purchased at a more attractive price. Quality is extremely important, but does not trump valuation. Both should be considered for the intelligent investor. Would you rather have 49 shares or 50 shares of the same high quality company for the same amount of money? I can tell you what doesn't really matter. Who wins the election. Do you really think who wins the Presidency will affect how many people buy Coca-Cola (KO) products around the world over the next 50 years, or whether or not Johnson & Johnson (JNJ) will continue to innovate new products in health care over the course of many decades? Will Obama or Romney really impact whether or not Philip Morris International (PM) is exponentially more profitable 30 years from now? Of course not! So what I do is ignore all the noise. I don't really pay attention to the election, much like I don't pay attention to what talking heads on CNBC are saying about the news du jour. I just continue to invest in high quality companies that have strong fundamentals and reward me as a loyal shareholder with rising dividend payouts year after year. I continue to reinvest those dividends back into these high quality companies, along with fresh capital from my day job. I consider valuation strongly and most importantly I hold for the long-term, while still monitoring the companies for major shifts in business models or deterioration. Noise is nothing more than a distraction, or even worse a roadblock, to my long-term ability to build wealth. How about you? Do you ignore the noise?